Two goals in four second-half minutes condemned FC Halifax Town to defeat in their final home game of the season as they lost 2-0 to Torquay. Substitute John Campbell and the impressive Kadell Daniel earned The Gulls only their second away win in 13 attempts to ensure Halifax’s home campaign ended on a low note. Town offered some bright moments in glimpses but it’s a shame the freshest memory the home supporters will take from the campaign is of slumping to a home loss. Had Halifax been more clinical, they would have got something from the game, but by the time the visitors established their lead, it was too late. It’s now one win in 14 games for Neil Aspin’s men, and one win in seven home matches. Never before has a season under Aspin tailed off without anything to play for, with The Shaymen probably wishing they didn’t have to travel to Woking next week either. There was still a round of applause as the Town players signed off for the season at full-time, with a top-ten finish on the cards; a creditable achievement for a part-time outfit but perhaps tempered by the manner of Town’s ending to the campaign. Like Tuesday night, the atmosphere was pretty flat, with Megaphone Man’s loud hailer being heard loud and clear. But unlike that game, neither side had anything to play for. At least that was true on the face of it, but there was a metaphorical question mark hanging over a good few players on both sides who had contracts due to expire. James Bolton, whose future looks very secure at The Shay, nearly headed Town into the lead after 10 minutes but for a superb reflex save by Dan Lavercombe. Danny Hattersley then headed off target from the resulting corner. Torquay avoided the expense of an overnight stay in Yorkshire by setting off at 7am on Saturday morning. 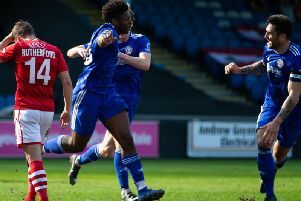 But Toby Ajala and Louis Briscoe looked like they’d had a restful kip on the way up as they combined twice in the opening few minutes, with Ashley Yeoman the recipient second time around before dragging his hot wide. Town looked a little shaky at the back, while Torquay offered a threat going forward when on the ball in the final third. That didn’t happen too often though, with both sides guilty of squandering possession cheaply and struggling to build any sustained pressure. Town’s injury list got a bit longer after just 17 minutes when Bolton was forced off and handed a watching brief alongside the likes of fellow absentees Richard Peniket, Lois Maynard and Scott Boden. Adam Smith had seen plenty of the ball early on, with most of Town’s attacks flowing down the right, but he was doubled-up on effectively and got little joy out of left-back Levi Ives. On the other flank, Jack Muldoon, another of those with a contract possibly in the offing, didn’t see much of the ball, with chances few and far between. There was a distinct end-of-season feel to the contest, especially the atmosphere. Neil Aspin took the chance to experiment a little, with Kevin Roberts starting just in front of the back four, and staying there even when Bolton was replaced by Matt Pearson. And Roberts was impressive, although more often than not, Halifax couldn’t build on the possession he had won back. Smith was Town’s best outlet, turning Ives this way and that before providing a peach of a cross, but turned away in frustration when none of his team-mates were there for a tap-in. Unsurprisingly, Torquay defender Aaron Downes, whose 71 clearances before the game were more than any other defender in the league, was there to hoof it away. Torquay’s threat going forward had completely dissipated by now, with Smith leading a livelier Town attack. Then from a poor back-pass by Scott McManus, for the second consecutive Saturday, Matt Glennon was forced into a first-time clearance that let in Yeomans. But Kevin Roberts produced a superb block before Briscoe fired wide and Town were off the hook. Good job John Akinde doesn’t play for Torquay. There was another let off just after half-time when hesitancy between Marc Roberts and Glennon let in Ajala, but he lost control of the ball with the goal gaping. With both sides playing fairly conventional 4-4-2s, with Muldoon alongside half-time sub Jamie Jackson, there was no reason why there shouldn’t now be a flurry of chances. It didn’t exactly pan out like that but Muldoon was certainly seeing more of the ball, as was Will Hatfield having been switched to the right-flank. After some darting runs from Hatfield, Muldoon did the same and charged into the box but fired high over the bar. It was better from The Shaymen though, with a promising move featuring some neat inter-play culminate in Smith’s cross headed off target by Kevin Roberts. A superb through ball by McManus then played in Jackson for the best chance of the three, but he was denied by Lavercombe’s outstretched left-foot. Those chances came back to haunt Town soon afterwards though when Torquay’s two substitutes combined when Courtney Richards’s flick on ran perfectly for Campbell, whose scuffed finish rolled agonisingly beyond Glennon. If that finish was fortuitous then Daniel’s effort was anything but as his magnificent free-kick flew past Glennon from 30 yards three minutes later. As far as goals at The Shay this season go, only Woking Guiseppe Sole can arguably have scored a better one. That double-salvo ended the game as a contest, with the match and Town’s season petering out. Halifax: Glennon, K Roberts, M Roberts, Bolton (Pearson 17), Hutchison, McManus, Smith, Marshall, Hatfield, Muldoon (Schofield 83), Hattersley (Jackson 46). Subs not used: Senior, Williams. Torquay: Lavercombe, Downes, Pearce, Harding, Dawson, Ives, Briscoe (Campbell 61), Daniel, Yeoman, Ajala, McQuilkin (Richards 68). Subs not used: Rice, Young, Gueguen.